Welcome! Our office has been described as casual and easygoing, fun, warm and inviting. If you’re visiting our Brentwood chiropractic care center for the first time, we’d like you to know exactly what to expect. We want to provide you with an experience where you feel confident in your choice of making Brentwood Advanced Chiropractic your health care provider. Your second visit will take approximately 20 minutes. During this time, Dr. Rick will evaluate your examination and X-ray findings to help you understand the source of your problem. He’ll then propose a customized care plan to help your spine to repair and stabilize as quickly as possible. Most of our patients are aware that optimal nervous system function through regular adjustments is just as important as going to see the dentist on a routine basis. Once your spine has been corrected and stabilized, however, we respect your decision to choose what is best for your health and happiness. We believe that the power that made the body can heal the body. 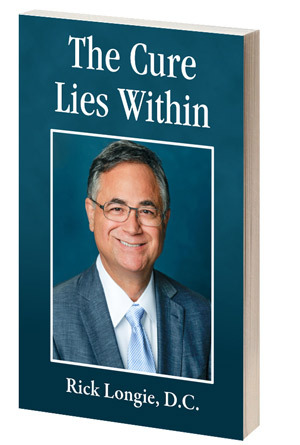 Every patient receives a copy of Dr. Rick‘s book at their first appointment. Schedule your appointment today and start your journey to better health.